La construcción de la capilla se puede fechar entre 1590 y 1600; su ubicación dentro de la Plaza Central sugiere que en este espacio, ya desde tiempos prehispánicos se llevaban a cabo ceremonias importantes, que se prolongaron hasta la época de la conquista con la religión católica; se supone que en esta entonces Dzibilchaltún tenía una población numerosa que justificó la construcción de la capilla. En el frente se puede apreciar la base que delimitaba su extensión, zona que quedó cubierta por lo que fue su nave, hecha de paja y morillos de madera. Conserva aún estuco pintado. Los restos de la casa cural, que se pueden ver inmediatamente al norte, albergaron a los frailes que llegaban a oficiar. The marker can be seen roughly in the middle of this view of the ruins of the chapel. beeta’ab le chan najil k’u’o’. Tu táane ku páajtal u yila’al u chuunil tu ye’esaj tak tu’uk ku k’uchul, lela’ jp’áat pixa’an tyo’olal u wiinklil, meenta’an yéetel xa’an yéetel che’. Yaan ti’ u xiixelo’ob luuk’ bona’an. U xóot’olo’obil le tu’ux ku yantal le jk’iino’obo’, ku yila’al te’ xamano’, te’ ku k’a’amal le jk’lino’ob ku taalo’ob ka’ach meyaj te’ela’. The construction of the chapel can be dated between 1590 and 1600. 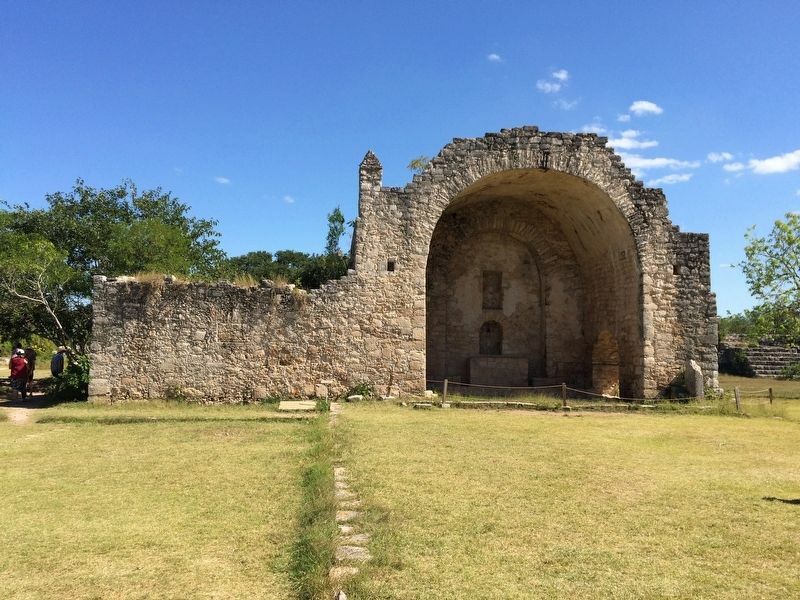 Its placement in the Central Square suggests that, since Pre-Hispanic times, this space was used for important ceremonies; ceremonies that continued within the Hispano-Catholic ritual. It is understood that Dzibilchaltun was sufficiently populated to justify the construction of a chapel. 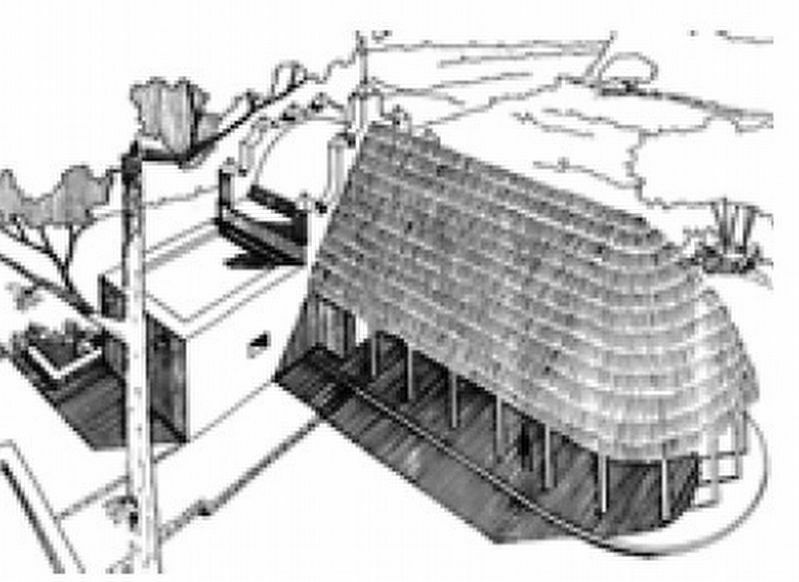 From the front one can see the baser that outlined its extension, an area covered with what once was its nave, made out of straw and branches. The painted stucco can still be seen. The remains of the parish, directly to the North, housed the Friars who came to officiate. The Parish (Friars' Quarters) ruins can be seen to the north of the Open Chapel. Note Structure 36 in the distance. 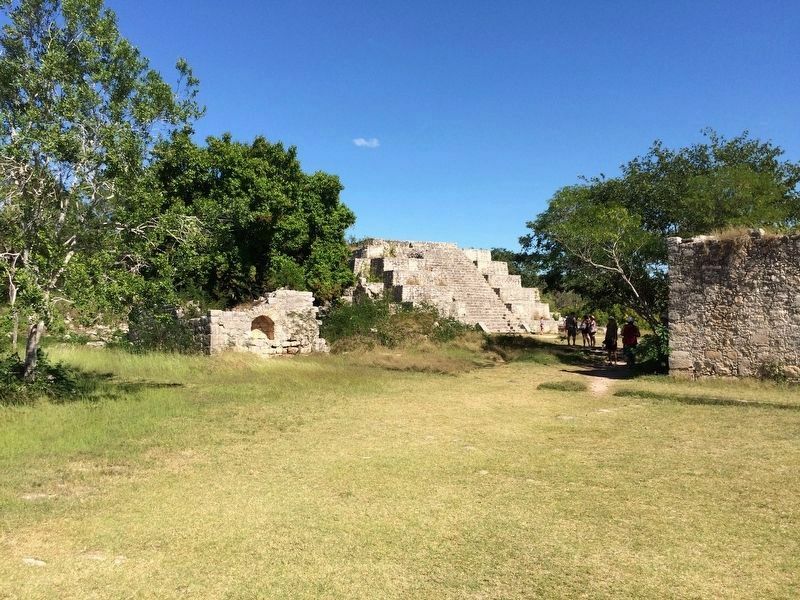 right after the entrance to the Dzibilchaltun Archaeological Zone. The park is off the road towards the small village of Dzilbilchaltun, to the east some 20 km north of Mérida on the Mérida-Progeso Highway (Hwy. 261). Marker is in this post office area: Dzibilchaltún, Yucatán 97300, Mexico. Touch for directions. Other nearby markers. At least 8 other markers are within walking distance of this marker. Central Square (within shouting distance of this marker); Structure 36 (within shouting distance of this marker); Substructure 38 (within shouting distance of this marker); Edifice 44 (within shouting distance of this marker); Dzibilchaltún Archaeological Site (about 180 meters away, measured in a direct line); Sacbe 1 (about 210 meters away); The Habitational Complex (approx. 0.4 kilometers away); Adjoining Rooms (approx. 0.6 kilometers away). 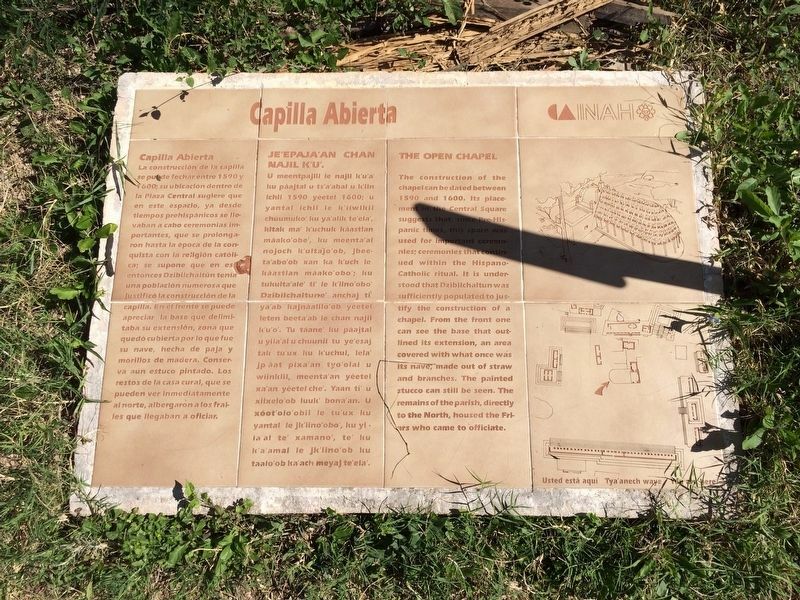 Touch for a list and map of all markers in Dzibilchaltún. This cenote is some meters west of the Open Chapel. As the Yucatán has no rivers, cenotes (naturally formed sinkholes that are open to groundwater) were traditionally the main water sources for the Maya and early Spanish colonizers. 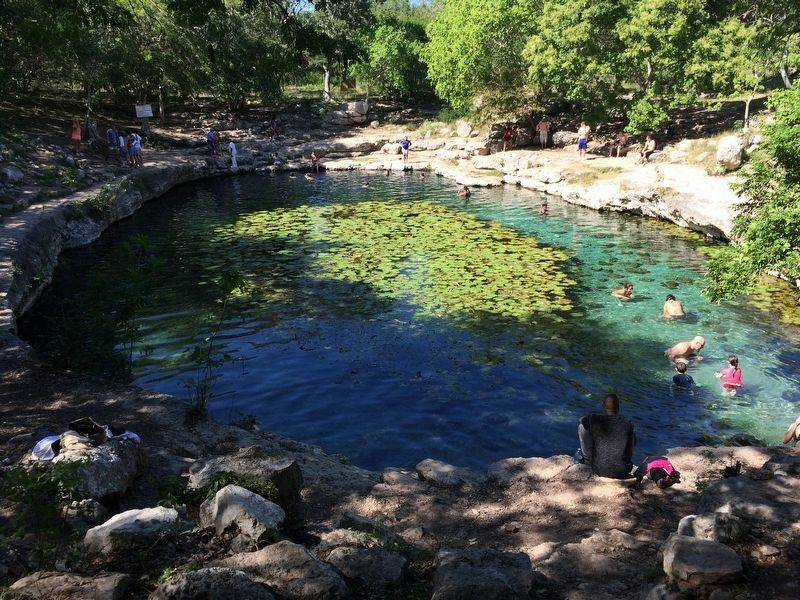 This cenote is now used as a local swimming hole. This image (which appears to be the image on the marker) shows how the chapel probably appeared. It was taken from "Folan, William. 1970. The Open Chapel of Dzibilchaltun, Yucatan. Middle American Research Institute. Publication 26: 181-199. Tulane University. New Orleans." More. Search the internet for The Open Chapel. Credits. This page was last revised on January 29, 2017. This page originally submitted on January 29, 2017, by J. Makali Bruton of Querétaro, Mexico. This page has been viewed 112 times since then and 8 times this year. Photos: 1, 2, 3, 4, 5. submitted on January 29, 2017, by J. Makali Bruton of Querétaro, Mexico.